The company has a lot of potential, but several key red flags should give investors pause. Engineered biology conglomerate Intrexon (NASDAQ:XON) is mired in a rut of setting new 52-week lows. The stock didn't do anything particularly special in 2016 and is now down 24% since its IPO in mid-2013. Despite the rough life in the public markets so far, investors are drawn to the company's long-term growth potential. After all, it grew revenue from under $24 million in 2013 to over $173 million last year -- a figure which should eclipse $200 million in 2016 -- and has multiple irons the in the fire spanning markets as diverse as fuels to biopharma to agriculture. Yet while there are solid reasons to buy the stock, but let's first consider three great reasons to sell Intrexon. The company has certainly delivered impressive top-line growth in recent years, but it's important to consider the finer details. Intrexon reports three segments: product revenue, services, and collaboration and licensing. The category that will drive long-term value creation and growth -- product revenue -- has actually been shrinking lately. Swelling revenue from collaboration and licensing has more than picked up the slack, but it's the riskiest part of the company's operations. It's tough to argue with 10% growth, except when most of it comes from companies worth less than $1 billion (and several worth only tens of millions of dollars). Worse, the dependence only grew deeper in 2016. To be fair, Intrexon's portfolio is still relatively young and has relatively few products to sell. Nearly all of its product revenue today comes from cattle breeding services. Genetically modified apples and sterile mosquitoes make small and growing contributions, while fish feed proteins could begin generating revenue in the next several quarters. Successfully commercializing products is core to the company's "many shots on goal" strategy, but new product launches have been frustratingly slow for investors. To build a conglomerate from scratch, you need access to capital and promising companies to acquire. The good news is that Intrexon hasn't encountered a shortage of either. The potentially worrisome news is that playing that game means shareholders will need to live with a balance sheet comprising high levels of goodwill and intangible assets. At the end of September 2016, goodwill and intangible assets were responsible for 39% of the company's total assets. A good benchmark for investors is 20% -- anything above that could be considered a red flag. But it gets worse: The two categories comprise 57% of non-current assets. Intrexon hasn't completed an asset writeoff or impairment yet, which hints that acquired companies are growing into their assumed valuations. However, the company has orchestrated several odd special dividends to offload underperforming or risky assets onto shareholders in lieu of performing more traditional writedowns. Seriously. 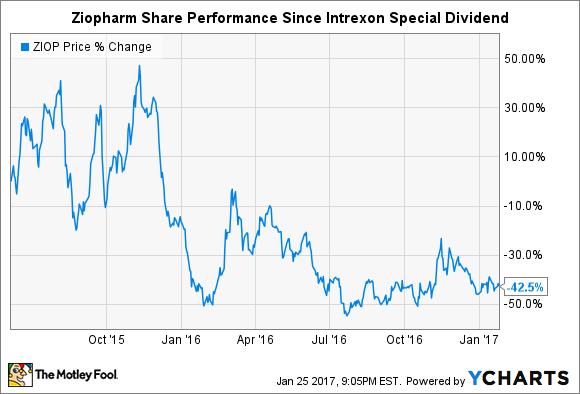 In June 2015, Intrexon issued 17.8 million shares of Ziopharm, one of its risky collaboration partners, to its own shareholders. The shares have lost 42% of their value since. This month the engineered biology conglomerate did the same with 53.3 million shares of AquaBounty Technologies. That amount represented over 31% of Intrexon's position in the upstart company, which has encountered regulatory hurdles for nearly 20 years, and the special dividend payout will lower the company's ownership stake from 63% to approximately 43% after a 1-30 reverse stock split. It may be marginally better than simply impairing goodwill levels, but the special dividends should be viewed for what they are: creative ways to offload risky assets. If you've ever viewed an investor presentation or press release from Intrexon, then you've probably been lost at times. The company seemingly claims to be able to cure or treat all diseases, protect all crops with its novel biopesticides, grow the biggest cattle, and make the cheapest transportation fuels, among other feats of science. It makes for a great story, but commercializing products -- especially in biotech -- is several orders of magnitude more difficult than storytelling. Importantly, there are solid reasons to doubt the company's purported technical prowess. The complexity pours over into less technical dealings, such as SEC filings and financial transactions (see: special dividends). Investors may feel uncomfortable with the complexity of operations, which requires a minimum level of blind faith in management. If it's difficult for individual investors to track technical and financial progress, then it will be difficult to see warning signs that something isn't right. While I understand the allure of Intrexon's pitch to investors, I have concerns about the company's dependence on micro-cap companies for revenue. If it were truly a technology leader, then why doesn't significantly more revenue come from blue-chip partners? Mr. Market appears to be tiring of the talk entering 2017, too, which could continue the stock's slide. Therefore, investors should consider the three great reasons to sell the stock mentioned here.